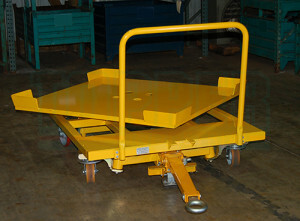 The concept of the Transformer Cart was designed by Topper Industrial. Recently, Topper Industrial added a rotate top to the design to make it even more innovative. The Transformer Cart is a four wheel steering cart that transforms into a hand operated push cart. The Transformer Cart functions as follows: By tipping the tow bar down, the cart transforms from a push cart into a four wheel steering cart. 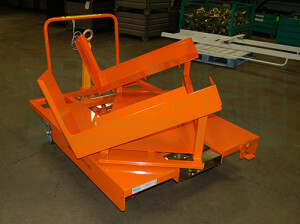 To return the four wheel steering cart to push cart mode, it can be done simply by lifting the tow bar upwards. The transformer cart by itself is very versatile cart being able to function as two. By adding the rotate top to the original Transformer design, it increased the cart’s functionality more. The added top rotates 360 degrees to the variable operator workstations. The cart combined two very useful ergonomic conditions. First, the four wheel steering cart becomes a push cart making it very maneuverable. Secondly, by having a rotating top the parts are more accessible to the operator at various points of reaching. Most Products are Patent Pending.